On Monday 12 March, new restrictions were introduced for taxis driving in the area around College Green in Dublin’s City Centre. During the hours 7am to 10am, Monday to Friday, taxis will not be permitted to travel southbound through College Green. The measure will affect vehicles moving in front of Trinity College, either towards Grafton Street, or towards Dame Street. Approximately 150 taxis per hour move southbound through College Green during this peak. 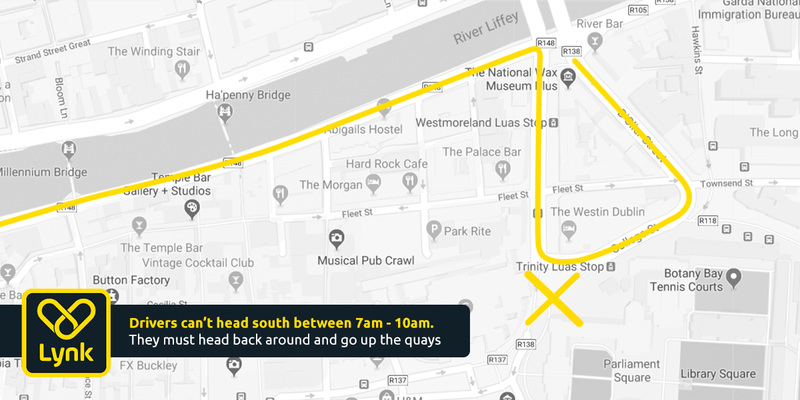 Outside of these peak morning hours, taxis can continue to use this southbound route through College Green towards Dame Street or Grafton Street. Between the hours of 12.00am (midnight) and 6am taxis will be permitted to travel northbound through College Green from Grafton Street Lower – i.e. using Dawson Street, Nassau Street and Grafton Street Lower. This will facilitate taxis to operate in this part of the city centre which caters for high volumes of night time social activity. Taxis travelling through College Street towards Westmoreland Street are unaffected. Northbound movements by taxis from Dame Street towards Westmoreland Street are unaffected. A right turn will be provided at the south end of Fishamble Street to facilitate taxis using this alternative route. 27 bus routes (30%) have already been removed from College Green.